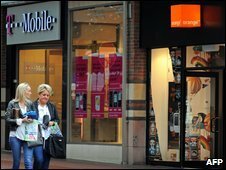 The European Union has ruled the merger between Orange and T-Mobile in the UK can go ahead - with some conditions. The tie-up between the two would create the biggest mobile network provider in the UK with 28 million customers. The European Commission said certain steps must be taken to protect the UK's smallest network operator, 3. The group must also sell off a quarter of its spectrum on the 1,800 MHz band, one of three frequency bands currently used by UK mobile providers. The new telecoms giant would control 84% is this bandwidth, which is part of the radio spectrum used for web surfing on mobile phones and is crucial to the government's plans for the country's future technological development. The Office of Fair Trading (OFT) - the UK's consumer watchdog - was concerned about both these issues and asked the Commission to investigate further. The Commission took the OFT's view into account and said France Telecom - owner of Orange - and Deutsche Telekom - owner of T-Mobile - could merge their UK units if they agreed to amend "an existing network sharing agreement" with 3 "to ensure that there remain sufficient competitors in the market". The OFT said its competition concerns had been "fully addressed". Joaquin Almunia, the EU's competition commissioner, said: "I am happy that we managed to resolve the competition issues in this case quickly in close co-operation with the member state concerned." The UK is Europe's second biggest mobile phone market, and a combined T-Mobile-Orange business will have a 34% share of the sector. Currently the market leader is O2 - owned by Telefonica of Spain - with a 28% share. Vodafone has 25%.